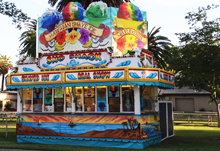 Lynn’s Hawaiian Shave Ice is a family owned business that is based in the Sacramento area of Northern California. We are honored to be affiliated with many of the finest fairs throughout the state, and are proud members of the Western Fairs Association. 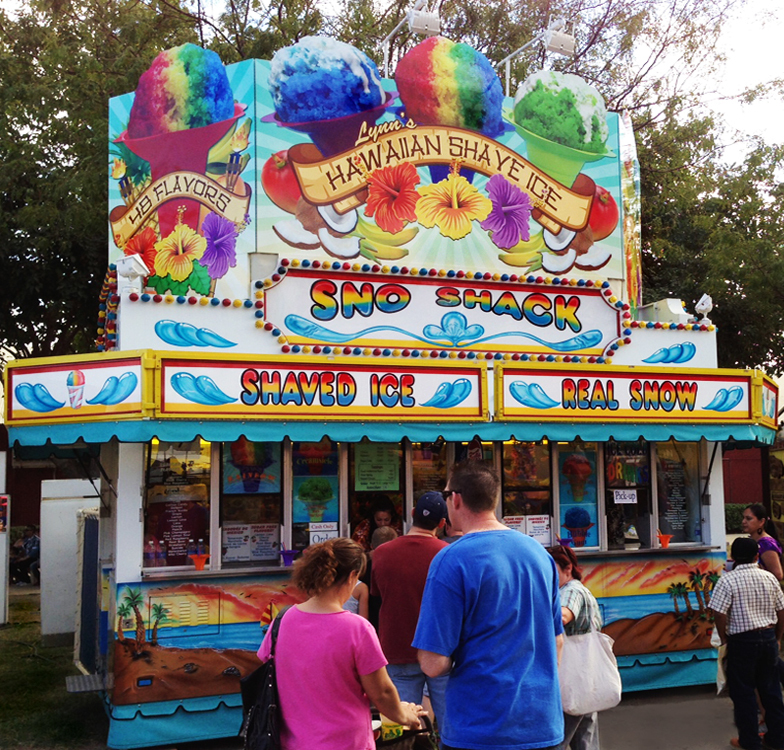 Lynn’s has always taken great pride in serving one of the finest examples of authentic Hawaiian Shave Ice available. At Lynn’s, we exclusively utilize the finest (and most expensive) commercial block ice shavers on the market- period. Lynn’s does not use inferior cubed ice shaving equipment. Many shave ice companies advertise that they serve Hawaiian Shave Ice, but try to do so using cubed ice shavers. Cubed ice shavers are relatively cheap, and commercially packaged cubed ice is readily available, Such a combination appears to create a viable food processing alternative. However, cubed ice shavers produce a coarse texture of ice with a rating of 5 or 6 on the texture fineness scale. Our premium block ice shavers always produce a “real snow” texture of 9 or 10 on that same industry recognized scale. A rating of 10 on this scale simulates actual snowfall. Fact: a premium block shaver will always produce a much finer texture of product. A finer texture of ice allows our products to retain their flavor near the top much longer. Simply put, our superior shaving equipment produces a perfectly smooth "melt-on-your-tongue" product that is full of flavor from start to finish. Our friendly uniformed employees will greet you with a warm aloha and provide you with exceptional service. At Lynn’s, we are as passionate about our customer care as we are about the texture of our ice! Our staff is thoroughly trained and dedicated to exceeding the expectation of each and every guest. Each shave ice product is a work of art that is created by shaving snow from a large block of ice. We offer 45 of the finest flavors available in the industry today (including many sugar-free flavors). Our toppings include a "snow cap" of sweet cream, ice cream on the bottom, super sour spray, and several exotic flavor mixtures. At Lynn’s, we proudly serve our creations in colorful premium flower cups. Keep in mind, not all flower cups are equal. The cups many others use are from China. While the Chinese flower cups are much cheaper, they often leak near the base (this creates a huge mess for the customer). Inconsistent color amongst the cups, thin spots at the base, and overall “fit & finish” issues have steered us away from these less expensive Chinese alternatives. In addition to our famous Hawaiian Shave Ice, Lynn’s offers several popular flavors of all-natural fruit smoothies. Once again, we exclusively use the same smooth textured block-shaved ice for our smoothies. A wide assortment of ice cold beverages is also available.